This Second Edition of Susumu Kawamura's landmark volume offerscomprehensive coverage of water treatment facility design, from thebasic principles to the latest innovations. It covers a broadspectrum of water treatment process designs in detail and offersclear guidelines on how to choose the unit, process, and equipmentthat will maximize overall efficiency and minimize maintenancecosts. This book also explores many important operational issuesthat affect today's plant operators and facility designers. 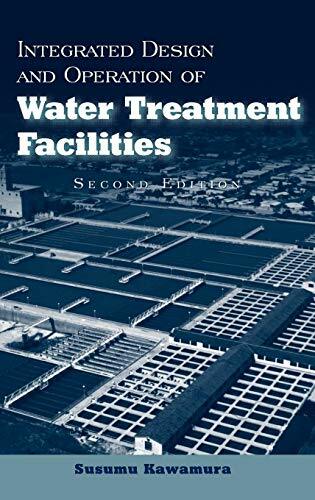 Supplemented with hundreds of illustrations, charts, and tables,Integrated Design and Operation of Water Treatment Facilities,Second Edition is an indispensable, hands-on resource for civilengineers and managers, whether working on new facilities orredesigning and rebuilding existing facilities. SUSUMU KAWAMURA, PhD, PE, Senior Vice President and Corporate Technical Director for Montgomery Watson, Inc., has nearly five decades of experience in every facet of water treatment facility design and operation.